The University of Sydney'sAssociate Professor Simon Howas last night named the NSW Young Tall Poppy of the Year. The prize, awarded by theAustralian Institute of Policy and Scienceto honour up-and-coming scientists, comes on top of Associate Professor Ho's recently awardedEureka prize. 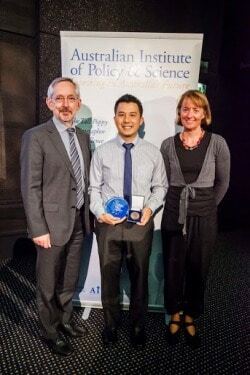 In a ceremony at the Powerhouse Museum last night Associate Professor Ho, from theSchool of Biological Sciences, won an award for his research on evolutionary biology as well as being named NSW Young Tall Poppy of the Year. The awards are given to scientists who combine world-class research with a passionate commitment to communicating science. Associate Professor Ho studies DNA and the rate at which it mutates to estimate the timescale of organisms' evolutionary history. His research has revealed that modern humans separated from Neanderthals about 200,000 years later than once thought. He also found that estimates of evolutionary rates appear to depend on the timescale over which the evolution occurs. He is currently involved in a number of international genome projects including a study of the evolution of birds. The study aims to better define the relationships among different groups of birds. It also tests the idea that the extinction of the dinosaurs allowed birds to diversify and thrive. Working with colleagues and students at the University of Sydney, Associate Professor Ho is also looking into the evolution of termites in Australia. The team found the habit of building huge mounds, which dominate parts of the outback landscape, only appeared recently during termites' evolution. It is the third consecutive year a University of Sydney Faculty of Science researcher has received the NSW Young Tall Poppy of the Year accolade.Dr Dennis StelloandDr Tara Murphy, both from the University'sSchool of Physics, won in previous years. Young Tall Poppy award winners spend a year sharing their knowledge with school students, teachers and the broader community through workshops, seminars and public lectures. They are nominated by their peers; selection is based on research achievement and leadership potential. "I hope that this award, along with my Eureka Prize for Outstanding Early Career Researcher, will bring attention to some of the exciting work being done on evolutionary biology in Australia," said Associate Professor Ho. "This research has great potential to enlighten us about the evolution of life on earth, ranging from the earliest appearance of complex animals to the recent emergence and spread of viruses. So I am excited by the opportunity to communicate this work to a wider audience." The Australian Institute of Policy and Science general manager, Camille Thomson, said the awards celebrate the country's best and brightest young achievers across the sciences and that they go on to "become role models by working with the education and community sectors to encourage greater engagement in science."